It appears the “mockbuster” has been around for a lot longer than The Asylum. 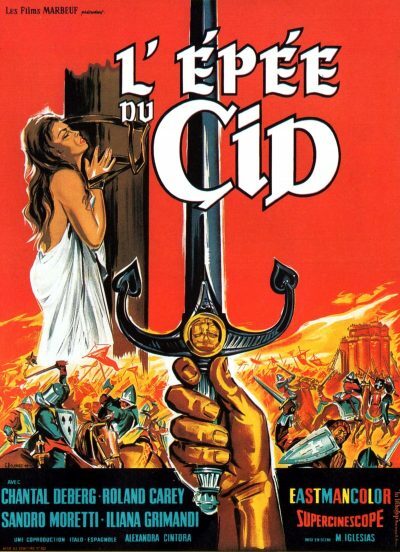 For this Italo-Spanish knock-off follows on the heels of the previous year’s El Cid, starring Charlton Heston as Castilian knight Don Rodrigo Díaz de Vivar – who presumably adopted the nickname after realizing it took him 30 minutes to sign a cheque. 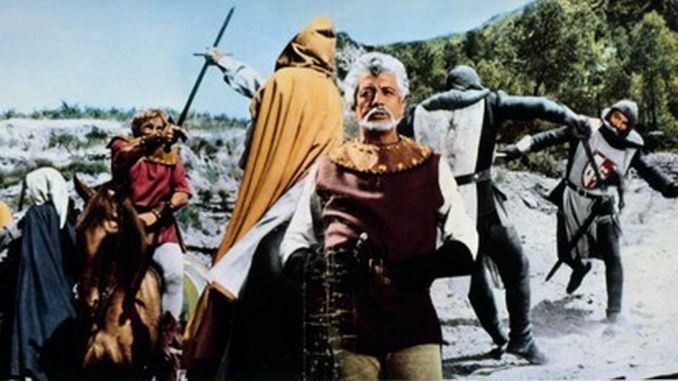 Anyway, he’s of no relevance here, since El Cid (spoiler alert, for those historically unaware) dies in the movie. This is all about his descendants: in particular his daughters, who get married off to a pair of abusive bastards, brothers Fernando and Diego Carrión. Seriously, their idea of fun is tying their wives to trees and riding their horses around in circles, whipping them. Er, the wives, not the horses. Inevitably, an artist’s impression of the scene makes its way onto the French poster (below). This doesn’t sit well with anyone, and judgment is handed down that the Carrións must face trial by combat. They ambush the intended opponents, but conveniently riding by is Ramón (Moretti), a poor but honest man who happens to have mad sword skills. It turns out he is also the unacknowledged heir to the throne of Catalonia, usurped by his uncle, Berenguer (Mejuto), who killed Ramón’s father to take the throne. However, the Carrións have teamed up with Berenguer, and will ensure Ramón never gets his chance to reclaim his rightful title. Fortunately, help is at hand, in the shape of the Cid’s nephew, Felix Muñoz (Pellicena), who raises an army and incites the peasants to rise up against the usurper, just in time to save Ramón. As with modern mockbusters, anyone expecting more than a shadow of its inspiration will be sorely disappointed. That’s especially true on the action side: I haven’t seem many more woeful attempts at battles, especially when one combatant is on horseback and the other on foot. Cautious and ponderous are the watchwords there. Moretti is no Charlton Heston either, though the film does have its share of famous glamour to replace Sophia Loren – though they didn’t know it yet. For playing one of the put-upon wives is Bianchi, who would achieve rather greater fame the following year, as Bond girl Tatiana Romanova in From Russia with Love. Seeing her is a small pleasure, and that’s about the only kind you’re going to get here. The cinematography is quite pretty, and as in the original film, the locations are (presumably) authentic enough to help out with atmosphere. Certainly, it must have been a great deal more convenient, not to mention much cheaper, to use pre-existing castles rather than having to build your own. The performances are likely not helped by being dubbed into English – are they ever? – so I’m reluctant to put too much blame there. The only scene which will stick in my mind is at the end, when the Berenguer is left, abandoned by all allies in his castle, as a literal mob with torches and pitch-forks converges. It has a poignancy, sharply at odds with the bland lack of emotion everywhere else.